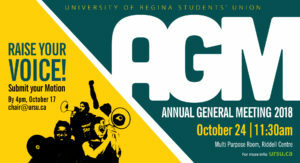 The 2018 URSU Annual General Meeting is your opportunity as a member of the University of Regina Students’ Union to make recommendations on the operations of your Students’ Union. This is your chance to address issues you’ve seen on campus, in the community or throughout your time as a UofR student. The AGM is the best time to have a say in the future of the URSU. All members we asked to attend the Annual General Meeting in the Riddell Centre Multi Purpose Room on Wednesday Oct. 24th at 11:30 a.m. Students must present their Student ID at the registration before the meeting to participate. If you are a registered, student union fee-paying student at the University of Regina (except those in ESL classes) then you are an URSU member and we want to hear from you! For more information please contact the URSU Board of Directors Chair by emailing chair@ursu.ca.